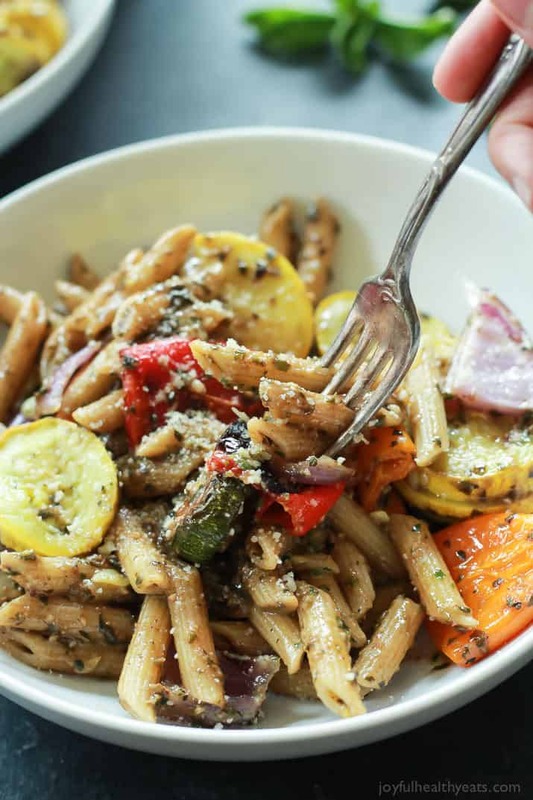 Basil Pesto Pasta with Roasted Vegetables, a simple kid friendly healthy summer pasta that’s done in 30 minutes! Does anyone else have basil growing like an out of control monster in their garden? I mean, I know we’ve been getting alot of rain lately here in Texas and that aids with growth, but man! It starting to look like a basil jungle out back! With the trips I’ve been taking lately I have to use up my basil any chance I get. We’ve made bruschetta, frozen yogurt, cocktails, and pesto. To me, homemade pesto is still one of the best ways to use up a truck load of fresh basil. Plus, you can’t beat homemade! So, with all the basil I have in the back, I decided it was time to make some pesto. One of my favorite ways to use Pesto is in a pasta! But instead of just a basic pesto pasta I added in a few fresh vegetables, roasted them so they got nice and sweet, and tossed them in the pasta along with the pesto! You will notice this recipe calls for mini bell peppers. Have you seen them in the grocery store? I have been kinda obsessed with them lately. They are so cute, (anything mini is :)) great to have on hand as a snack, and cook like rockstars on the grill or in the oven. And I love that they come in multiple colors! Things look way better and much more appealing when the colors are popping off the plate, am I right? Anyways, they are right over by the regular bell peppers ad come in a little bag with about 15-20 mini peppers. Get em’! You will love them! Baking Sheet – I used this to roast the veggies on! Large Pot with Strainer – I love this pot because all I have to do is pull the strainer out of the pot to drain the pasta and I’m set! 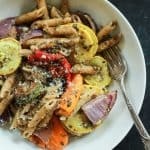 Basil Pesto Pasta with Roasted Vegetables, a quick easy diner idea that’s kid friendly, healthy, and done in 30 minutes! Place zucchini, squash, red onion, and mini bell peppers on baking sheet. Season with olive oil, salt, and pepper. Toss to coat. Bake for 20 minutes. Remove from oven and set aside. Bring a pot of water to a boil. Add pasta and cook until al dente, according to package directions. Drain pasta when done and reserve 1/2 cup of cooking liquid. In a large bowl add cooked pasta, roasted vegetables, basil pesto, and 1/2 cup of reserved cooking liquid. Toss to coat. Serve. Top with additional parmesan cheese if desired. IF YOU MAKE ONE OF THESE RECIPES, BE SURE TO SNAP A PIC AND HASHTAG IT #JOYFULHEALTHYEATS. I LOVE SEEING WHAT YOU MAKE! What a great recipe! I love homemade pesto and am always looking for new ways to use it! 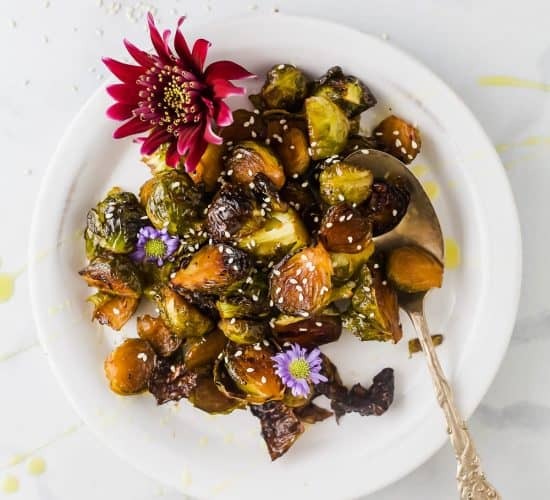 The roasted veggies paired with it sounds fabulous! 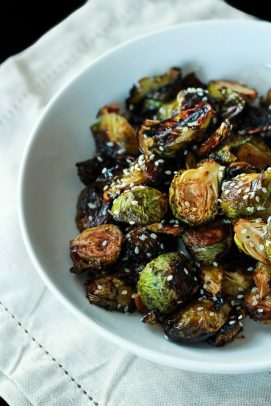 Love these gorgeous roasted veggies Krista. Yes, I have that basil monster(s) in my garden….beautiful dish! haha.. I’m glad I’m not the only one with the basil monster! So glad you liked the pasta recipe! 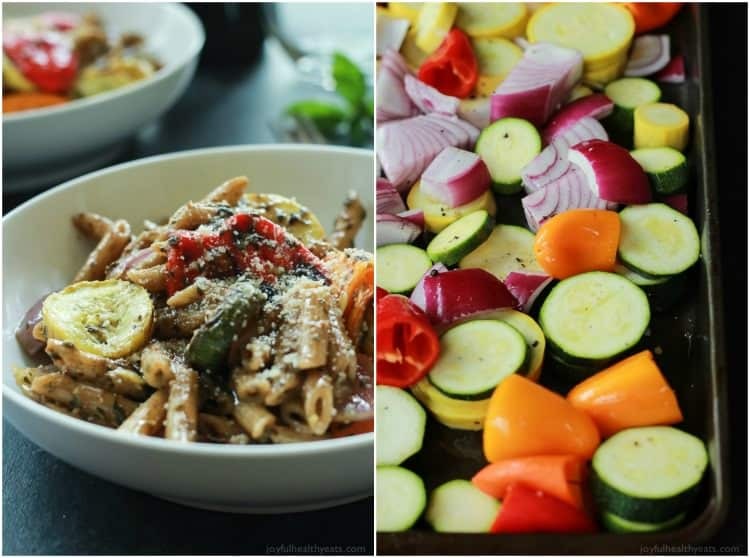 I’m a pushover for pasta and roasted vegetables! Put the two together and you have a really happy girl! Can’t wait to try this – it looks delicious! Looks delicious! I think this is exactly what I want for lunch! Good thinking! Lunch + This = heaven! 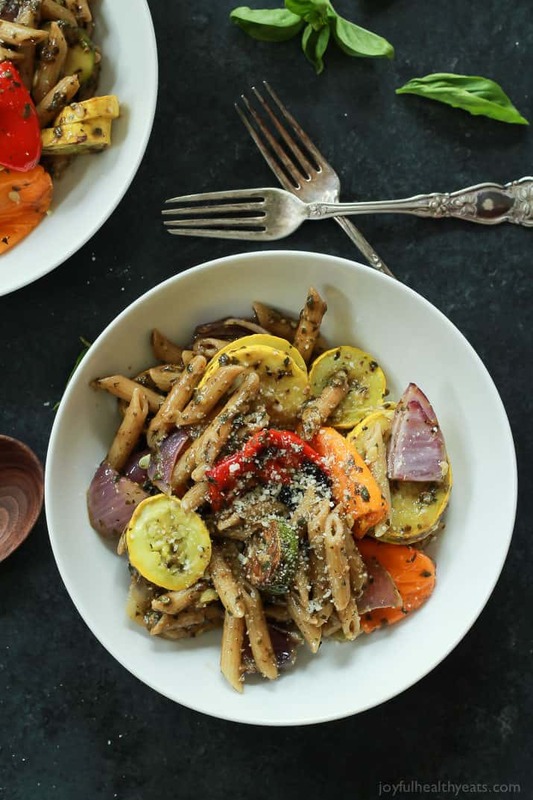 Only you could make a simple pasta with roasted vegetables look sooooo stunning! This looks amazing, Krista! PINNED! 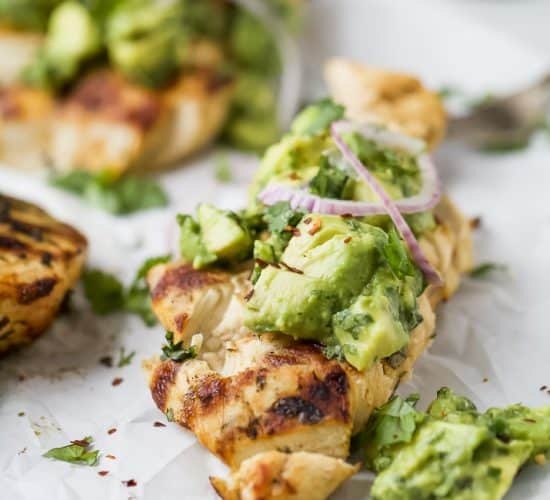 This is such a beautiful and healthy recipe!! 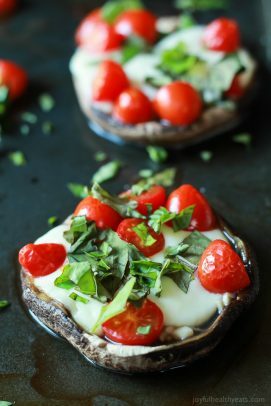 I want to try this soon, basil is my JAM! I love basil pesto in my pasta! I love basil pesto so much that sometimes I’ll spread it on my morning bagel instead of cream cheese. Have you tried it with an over easy egg? Do it, its amazing! Yay! So glad to see this right now. I have vegetables ready to roast and was looking for a recipe. Definitely going to try! Hurray! You’ll love it! Best way to use up extra veggies! Woot Woot! 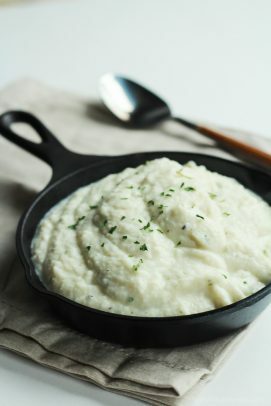 Sounds like this recipe is calling your name for sure if you already have all the ingredients! 🙂 Hope you like it Ashlyn! I am so jealous of your basil plethora! I will gladly take some! 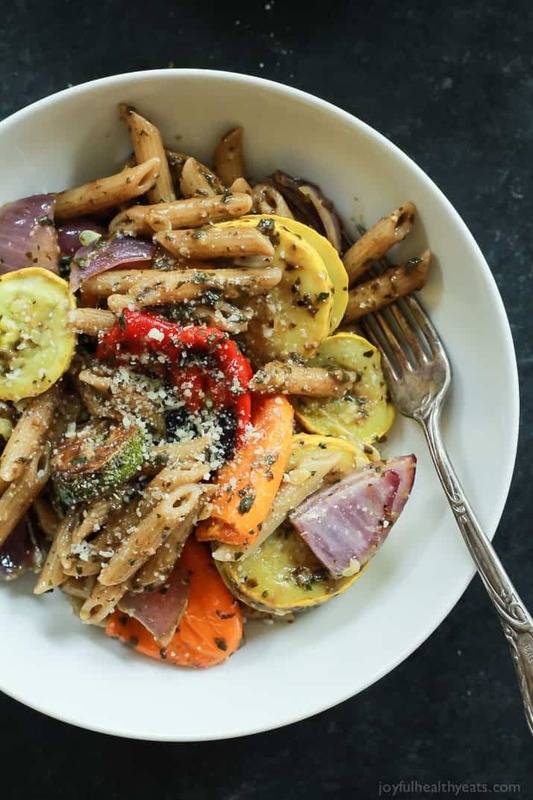 This roasted veg pasta has my name all over it, I love pasta loaded with veggies and pesto. Yum! I will so share! 🙂 I have it coming out my ears! hehe..
My basil always takes up the whole herb area! But I LOVE it. This pasta looks amazinggggg! I love roasted veggies! Perfect summer dish! exactly.. you need your own garden just for basil! Its ridiculously hearty! Glad you liked the dish girl! My boyfriend loved it. Thank you Krista. Woohoo! So glad to hear that Silver!